[tps_footer]Bollywood actor Shah Rukh Khan, who recently bought brand new BMW i8, was spotted driving his new car in Bandra, Mumbai. The actor planned to go on a drive in his new car, which caught the attention of many. Many fans took pictures and videos of the actor as they spotted Shah Rukh Khan in a swanky white car. Not to be surprised, the pictures soon went viral on social media. 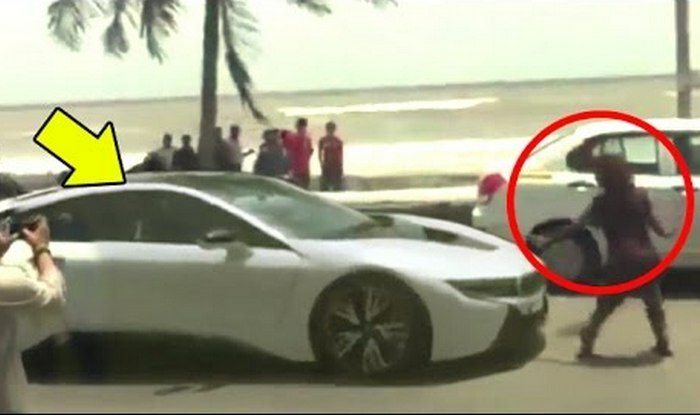 Many are not aware of what happened when Shah Rukh Khan’s car reached at Bandstand. As soon as his car reached Bandstand, SRK was attacked by a homeless woman, who seemed to be a beggar. The woman asked SRK to stop the car on the busy street, considering that she wasn’t aware of SRK being in the car. One can see in the video, the girl is lying down on the car’s bonnet, trying to stop the car firmly. The woman had to be carried away by actor’s bodyguard to prevent her from getting hurt. Well, being a public figure and a superstar, such incidents keep happening with the actor but this seemed to be too crazy. On the work front, Shah Rukh Khan will be seen in his much-talked film Raees, which is reportedly set to release next year. The actor will also be seen in Gauri Shinde’s next opposite Alia Bhatt. Previous articleKangana Ranaut’s SHOCKING REACTION Over Salman Khan’s ‘Raped Woman’ Comment Controversy! Next articlePhotos: Kangana Ranaut Looks Colossally Chic!